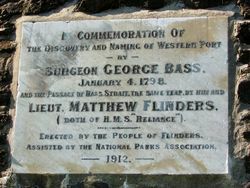 A monument commemorates George Bass for his exploration and naming of Western Port, and Bass and Matthew Flinders for their successful voyage in the sloop Norfolk in 1798 through the Bass Strait and around Tasmania. 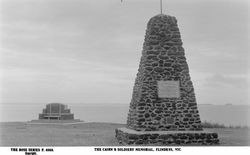 The memorial was unveiled in 1912 by Governor Sir John Fuller, with Captain Chambers, RN, Mr. F. Tate (Director of Education), and Mr M. M. Phillips (President of the Australian Natives Association). Doctor James Barrett expressed hope that the memorial would be ultimately replaced by an artistic monument more worthy of those gallant spirits whom they were honouring. Colonel Watson has prepared plans and specifications for the memorial to be erected at Flinders, Westernport (Vic), in memory of Bass and Flinders. The memorial consists of a stone pyramid, 20ft. high, on which is to be placed a tablet containing references to the famous voyages of Bass and Flinders. A detailed description of these voyages will be kept in the local library and State school, together with a map specially prepared showing the routes. Daily News (Perth), 15 April 1912.